Oral: Treatment and prevention of hypocalcemia. Oral: Adjunct in the prevention of postmenopausal osteoporosis. Essential for nervous, muscular, and skeletal systems. Maintain cell membrane and capillary permeability. Act as an activator in the transmission of nerve impulses and contraction of cardiac, skeletal, and smooth muscle. Essential for bone formation and blood coagulation. 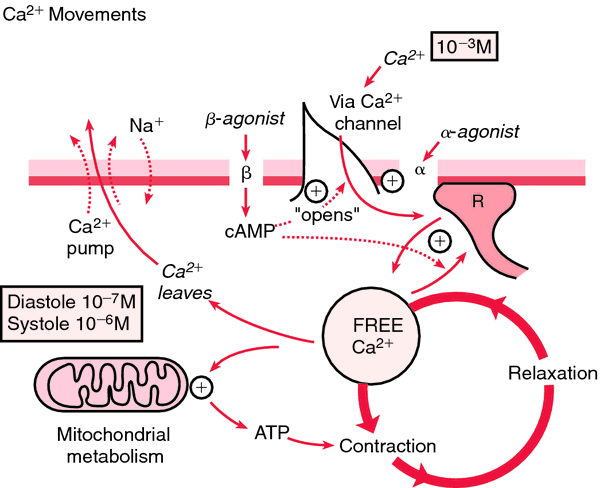 Replacement of calcium in deficiency states. Absorption: Absorption from the GI tract requires vitamin D.
Distribution: Readily enters extracellular fluid. Crosses the placenta and enters breast milk. Metabolism and Excretion: Excreted mostly in the feces; 20% eliminated by the kidneys. Contraindicated in: Hypercalcemia; Renal calculi; Ventricular fibrillation. Use Cautiously in: Patients receiving digitalis glycosides; Severe respiratory insufficiency; Renal disease; Cardiac disease. Hypercalcemia increases the risk of digoxin toxicity.Chronic use with antacids in renal insufficiency may lead to milk-alkali syndrome.Ingestion by mouth decreases the absorption of orally administered tetracyclines, fluoroquinolones, phenytoin, and iron salts.Excessive amounts may decrease the effects of calcium channel blockers.Decreases absorption of etidronate and risedronate (do not take within 2 hr of calcium supplements).May decrease the effectiveness of atenolol.Concurrent use with diuretics (thiazide) may result in hypercalcemia.May decrease the ability of sodium polystyrene sulfonate to decrease serum potassium.Cereals, spinach, or rhubarb may decrease the absorption of calcium supplements.Calcium acetate should not be given concurrently with other calcium supplements. 1 gram of calcium glubionate contains 64 mg elemental calcium (3.2 mEq calcium). Oral (Adults) —6–18 g/ day in divided doses. Oral (Children and Infants) 600–2000 mg/kg/day in 4 divided doses, maximum 9 g/day. Oral (Neonates) 1200 mg/kg/day in 4–6 divided doses. Calcium Supplement/Replacement: Observe patient closely for symptoms of hypocalcemia (paresthesia, muscle twitching, laryngospasm, colic, cardiac arrhythmias, Chvostek’s or Trousseau’s sign). Notify physician or other health care professional if these occur. Protect symptomatic patients by elevating and padding siderails and keeping bed in low position. Monitor patient on digitalis glycosides for signs of toxicity. Lab Test Considerations: Monitor serum calcium or ionized calcium, chloride, sodium, potassium, magnesium, albumin, and parathyroid hormone (PTH) concentrations before and periodically during therapy for treatment of hypocalcemia. May cause decreased serum phosphate concentrations with excessive and prolonged use. Assess patient for nausea, vomiting, anorexia, thirst, severe constipation, paralytic ileus, and bradycardia. Contact physician or other health care professional immediately if these signs of hypercalcemia occur. Oral: Administer with plenty of fluids with or following meals. Calcium Supplement: Encourage patients to maintain a diet adequate in vitamin D (see ). Do not administer concurrently with foods containing large amounts of oxalic acid (spinach, rhubarb), phytic acid (brans, cereals), or phosphorus (milk or dairy products). Administration with milk products may lead to milk-alkali syndrome (nausea, vomiting, confusion, headache). Do not take within 1–2 hr of other medications if possible. Instruct patients on a regular schedule to take missed doses as soon as possible, then go back to regular schedule. Advise patient to avoid excessive use of tobacco or beverages containing alcohol or caffeine. Osteoporosis: Advise patients that exercise has been found to arrest and reverse bone loss. Patient should discuss any exercise limitations with health care professional before beginning program. Increase in serum calcium levels. Decrease in the signs and symptoms of hypocalcemia.